Four Chambers Press presents poet Jack Evans for the release of their latest poetry collection, Rain is the Hourglass of Memory. The debut will take place at Practical Art (5070 N. Central Ave, Phoenix, AZ, 85012) on Saturday April 15th, at 5 p.m.
Evans was born on the banks of the Hudson. He is a music enthusiast of all types and enjoys both reading and writing poetry. Evans works have appeared in numerous publications and he has also preformed all over Arizona as well as the rest of the country. Evans is a co-director of the Caffeine Corridor series in downtown Phoenix. See the Facebook Event page for more details. To order digital and print editions of the book, visit Four Chambers Press website. Online PDF versions cost $5 and and print editions are $18. Come hang out in an indoors, relaxed atmosphere and share your passions and insights with a welcoming audience. Bring along poetry, flash fiction, or any other word-craft pieces that respect typical time allowances for group readings. We expect an hour of open mic with first come, first serve sign-ups; the last half an hour will feature one local wordsmith. If you are interested in featuring, please e-mail info@practical-art.com. Alison Erickson has a bachelor’s degree in Creative Writing from Northland College, where she received the Mary Van Evera Award for Best Poetry. Her work has appeared in several journals, including Dash, Aqueous, and North Woods Writers. In 2011, she earned an internship at The Adirondack Review, working as editor in the fiction department. 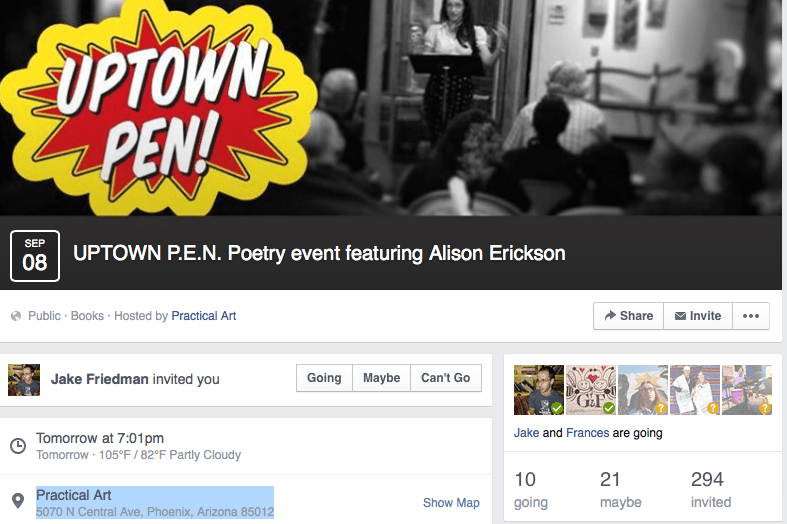 She currently serves as managing editor of poetry at Four Chambers Press in Phoenix AZ.